Yesterday, we were checking wheat fields in Whitman, Garfield, Columbia, Walla Walla, Benton, Franklin, and Adams counties of Washington and the Umatilla County of Oregon. Winter wheat crops ranged from Feekes 4 to 6. Stripe rust was found in breeding nurseries in Central Ferry (Garfield Co.) (Figure 1), our rust monitoring nurseries in Walla Walla (Figure 2), and nurseries at the Hermiston Station (Umatilla Co., OR) (Figure 3). 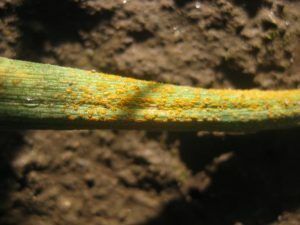 In our Walla Walla experimental fields, stripe rust developed in hot spots in the susceptible borders and appeared on many entries in the nurseries. No rust was found in commercial fields in Whitman, Garfield, Columbia, Walla Walla, and Adams counties. However, stripe rust was observed in Horse Heaven (Benton Co.) (Figure 4) and the Connell areas (Franklin Co.). In a field east of Connell, stripe rust was easily observed on grasses, but only one infected wheat leaf was found. Stripe rust was generally hard to find, except in one field in Horse Heaven, the incidence reached 5%. 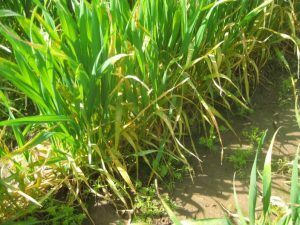 The previous forecast of close to normal epidemic level (18% on susceptible checks and 8 – 12% on moderately susceptible – susceptible commercial varieties) is still held. The previous recommendations should be implemented. 1) For susceptible or moderately susceptible winter wheat varieties (ratings 5 to 9 on the Buyers’ Guide), use fungicides at the time of herbicide application. For varieties with lower ratings, apply fungicides only when rust is found and before it reaches 5% incidence or severity. 2) For spring wheat, consider planting resistant varieties (ratings 1 to 4 on the Buyers’ Guide). 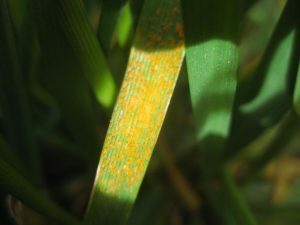 So far, stripe rust has been reported in Arkansas, Texas, Oregon, Washington, Mississippi, Georgia, Tennessee, Oklahoma, and Louisiana, and generally in low levels. 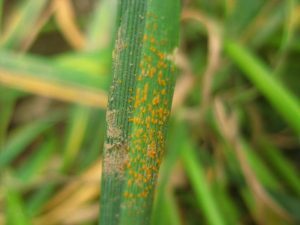 Barley stripe rust has been reported in an artificially inoculated screening nursery at Davis, but no wheat stripe rust has been reported in California. View the April 10, 2018 stripe rust update (pdf). Figure 1. Stripe rust in a breeding nursery in Central Ferry, WA. Figure 3. Stripe rust in a wheat field in Hermiston, OR. Figure 2. Stripe rust in an experimental nursery in Walla Walla, WA. Figure 4. Stripe rust in a commercial wheat field in Horse Heaven Hill, WA.